NIT Tiruchirappalli Recruitment 2017 has revealed their recent recruitment. They have announced for this recruitment for Laboratory Engineer jobs. Want to know more details? Here you will get pattern of examination, NIT Tiruchirappalli Syllabus, NIT Tiruchirappalli Question Paper, NIT Tiruchirappalli Admit Date Release Date, NIT Tiruchirappalli Exam Date, NIT Tiruchirappalli Result Date these details. Now check below all details. 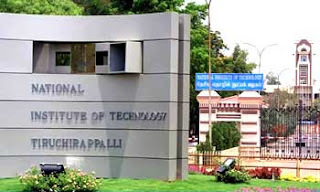 The National Institute of Technology, Tiruchirappalli, commonly referred to as NIT Trichy, is a public engineering institution near the city of Tiruchirappalli in Tamil Nadu, India. It is recognized as an Institute of National Importance by the Government of India under the National Institutes of Technology Act, 2007. The institute is located in a campus of 800 acres and has 16 departments covering engineering, applied sciences, humanities and management programs with a strong emphasis on scientific and technological education and research. Graduation details : M.E./M.Tech in Microelectronics/ VLSI system or equivalent from a recognized Institute are Eligible to apply NIT Tiruchirappalli Recruitment 2017.